There are two more weeks till the Easter, but everyone is already excited about it. Now, it’s a perfect time for making decisions about the biggest Christian holiday. How you’ll decorate your house, what you will cook and of course, which drinks will you serve for the big day?! Without exception, cocktails are part of any holiday table and this year will be the same! That’s why we’ve made an article where we’ve gathered Top 10 Perfect Easter Alcoholic Cocktails. Choose one or a few of these amazing recipes and satisfy your family members in the best possible way. Happy Easter everyone! We’re opening the list of Top 10 Perfect Easter Alcoholic Cocktails with a drink that requires just 5 minutes for preparation. 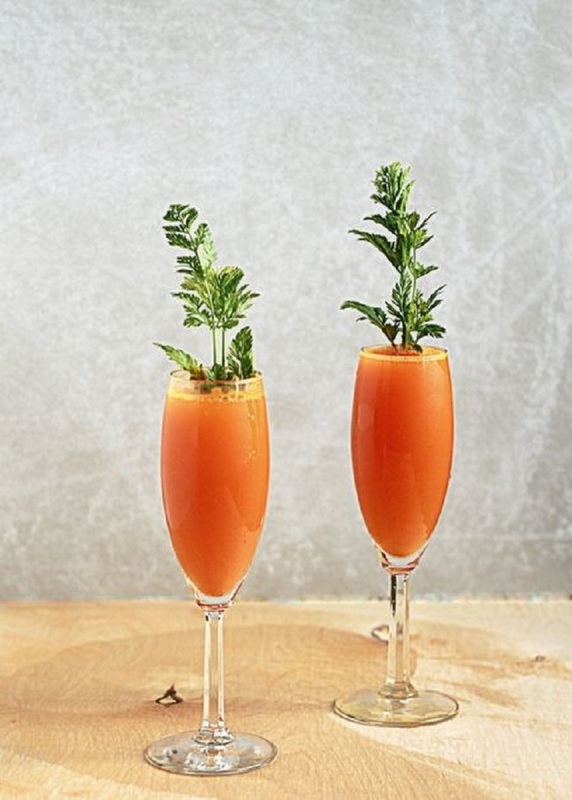 This Carrot Mimosas are a mix of beer, wine, liquor and pure carrot juice. For a real Easter effect, put some carrot stems or parsley sprigs on the top of the cocktail!